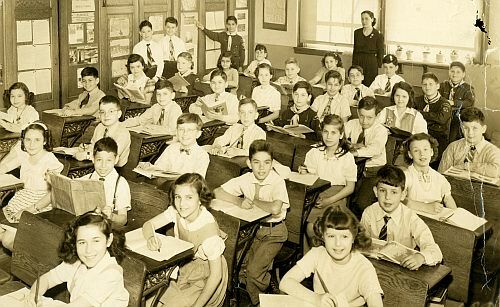 A Picture History of Kew Gardens, NY - Class Pictures - PS99 Grade 5-3 1947. Thanks to George Ehrenhaft for supplying many of the student names. Email me if you can identify any others. Irene Cortner, Leonard Lyon, Margaret Prendergast, Miles Hochman. Barbara Wagner, Winfield Ibert, George Ehrenhaft, Ronald Blanco, Frederika Martel, George Lieberman, Madeleine ?. 5th row: Suzanne Florsheim, Matty Speier, Dvora Granet, David Chambers, Marion Pascal, ?? Standing: Richard Burns, Richard Polay, ? ?